Hello everyone! I hope your week is going well so far? The brand new issue of Reclaim Magazine landed on my doormat this morning, which reminded me that I needed to share these snaps with you, from the previous issue! Issue 34 was about sharing practical tips for adding decorative flourishes to your home. I’ve shared the tips below, do let me know if you try any of them out! We all have those beautiful vintage fabrics tucked away, that we can’t bear to get rid of. Why not make a gorgeous gallery to show them off, by displaying them in embroidery hoops? 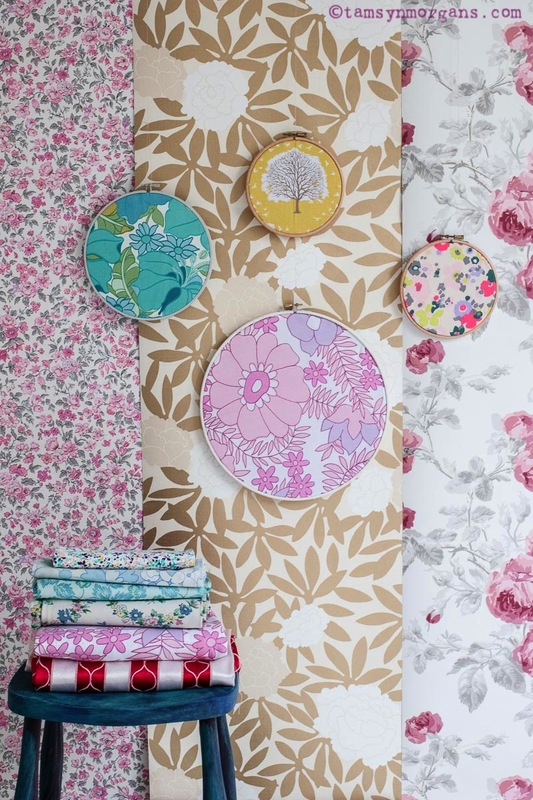 Mix and match your florals, stripes and colours for a really fun display, which you can change depending on the season. Vintage fabrics : Try www.thelinengarden.co.uk. It’s always worth looking for colourful retro sheets in charity shops too. I love open kitchen shelving. It looks clean and contemporary, yet is so perfect for displaying my vintage kitchenalia and crockery. 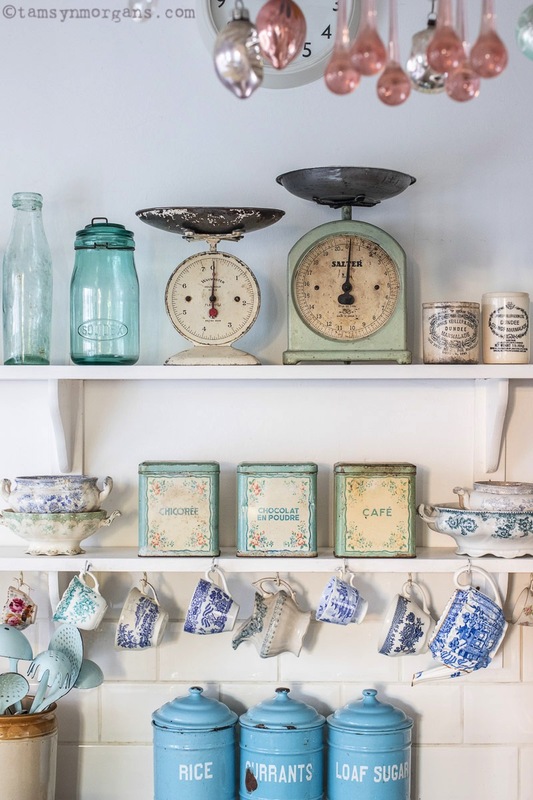 Hunt for vintage tins and caddies for storing teabags and other kitchen necessities, and display mismatched china for an eclectic look. Crockery : Car boot fairs and charity shops still have a plentiful supply of pretty vintage china. 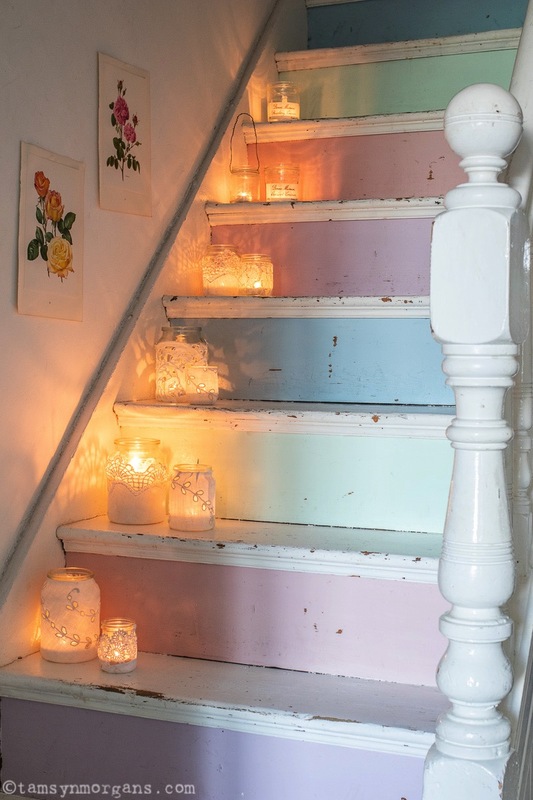 Turn your stairs from something ordinary into something colourful, by painting your risers in any colour of your choice. It’s a great way to add a pop of colour without committing to painting the entire hallway. I went for pastel colours, but dark inky blues and blacks also look gorgeous. Or, why not use leftover wallpaper samples for a really eclectic looking stair case? In other news, I have a rather exciting little project up my sleeve, which you will love! I’m not sure I can share it quite yet though, so a bit of a clue – it revolves around my attic room, which I have never shared here. As soon as I can spill the beans, I will! Just wee reminder that there is still to time for vote for me/this blog, which is up for a Soak and sleep blog of 2018 award – I would be so grateful for a vote, and it only takes a second!